Today Pittsburgh International Airport (PIT) announced their renovation plans for the former US Airways hub. This is just one of many new advances for the mid-size city over the last few years. Here’s what they have in store. Currently, passengers are checked in and go through security in a ticketing building separated from the terminal and transported back and forth by a short run subway tram. The new building will occupy an area already disused by current tenants and eliminate the journey. 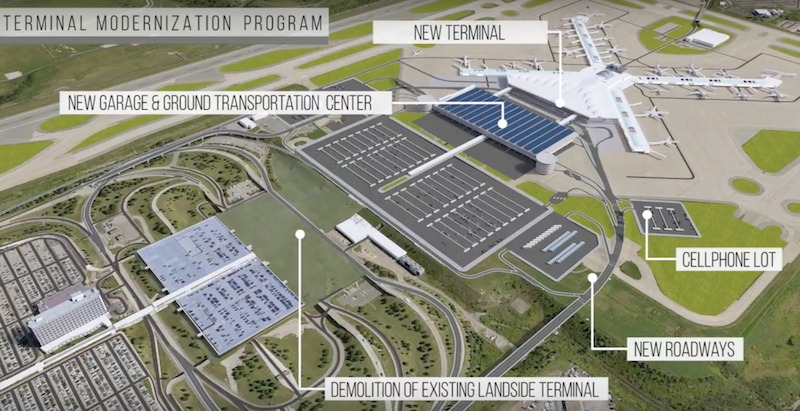 It will also update the airport, provide new parking opportunities, shorten transit times for passengers and baggage, and simplify the process. The $1.1 billion project is slated to start in 2019 with completion three years later though the start date has not yet been officially approved. The airport was originally built (brand new) in 1992 to accommodate US Airways Pittsburgh hub and operated all 75 gates. The new building will reduce the total gates down to 51, more inline with current activity and room for growth. The passenger terminal is X-shaped with concourses A, B, C & D. The current ticketing and security concourse is located between C & D but separated a from the building so not to take up gate space. This shift will instead eliminate some gates that are already unoccupied and push the terminal against the ticketing building. While the current ticketing and checkin facility is perfectly functional with more than enough checkin space for customers and carriers, growth would squeeze the space. The design is also showing its age. “We’ve got lots of systems nearing the end of their life. This building is 25 years old next month and we have inadequate [security] checkpoint facilities,” she said. Parking extends from the ticketing building and fans out with just a single covered garage which hosts onsite rental car facilities. The current checkin building may be replaced with more parking across from the new building though official plans for the current building have not been announced. The demolition of the current building is included in the $1.1 billion budget. Cell phone lots were not a necessity when the airport was built but has evolved to an important part of the airport experience. “The rental car facility will remain connected and will be located in the new garage directly adjacent to the new terminal. The new garage will be equipped as a modern ground transportation center.” – Bob Kerlik, VP Media Relations. Customs and Immigration is handled at the terminal. which causes some issues when transporting international customers from Customs through to their bags and keeping domestic passengers from roaming into the area. The facility is dated, but not ancient and in many ways the airport is just now coming back from the de-hubbing catastrophe that happened when US Airways moved their hub focus to Charlotte. Passive users of the facility will notice that the airport is not brand new, but not many would say that the airport desperately needs a new building. When sharing this information with a colleague who flies a few times per year from PIT, he felt that it was unnecessary and in fairness it is. As a frequent flyer from PIT it’s not hard to see why this is being done. CEO Cassotis has a vision and a plan for the airport and she is finding ways to make it the mid-size market leader. That’s really what I feel drives this more than anything else. Just take a look at what she has accomplished in just a few years at the helm. She recently made the airport the only one in the country with the capability of letting non-flying visitors accessible to the gate. She has added unique service where she can find it including charter service to China, and new international routes from Condor to Frankfurt, WOW Air to Reykjavik and was able to hold onto Delta direct service to Paris Charles De Gualle. She created incentives for OneJet to setup their mini hub with the most unique air service in the country (mid-size markets from Pittsburgh with direct, reasonably priced flights on small private jets). She even got Spirit to add and move flights from low-cost nearby Latrobe to move into Pittsburgh International. American and Delta also operate once weekly flights to Cancun Mexico and Allegiant has added flights to various destinations. A Priority Pass lounge also recently opened. Her vision is clearly not to recreate the US Airways glory days, I think she is realistic about the size of the market and the viability of a hub in between Philadelphia and Chicago (Cleveland is also just two hours away). She is trying to build the best airport for her available market. One problem that many passengers may not notice is that the ends of several concourse are closed off. This is done for both the convenience of passengers (shorter walks to gates) and the community of the terminal keeping vendors close together and close to customers. By reducing the number of gates while increasing traffic through the above new initiatives (and I predict Alaska Airways and perhaps Norwegian at some point soon) this will create the effect of a busier airport especially once the excess gates are eliminated. It does beg the question, if her plan is ultimately as successful as she hopes, won’t she need the extra gates again? What About the Hyatt Regency Pittsburgh Airport? We have often used the Hyatt Regency Pittsburgh Airport hotel ahead of particularly early departures especially when traveling with lots of luggage and our young daughter. It is currently connected to the ticketing facility which means that parking can be handled in the evening before a flight and guests can transfer to their flight in the morning without facing harsh Pittsburgh winters. That’s a lot of advantages to even local flyers like ourselves. However, it is clear that the building in which it is currently attached will no longer be in use and may be demolished. What will happen the direct connection for hotel guests? Will the hotel be required to run the shortest shuttle in mankind (akin to the Hyatt Regency but not Grand Hyatt at DFW)? I suspect they will find a solution that maintains this direct connection but it was not disclosed in any of the press covering the matter that I saw. It’s likely that it has not yet been decided as many of the details remain in the air. The airport authority reached back out to me on this answer too and as suspected, they don’t yet have an answer for how the airport hotel will connect (if at all) to the terminal. No taxes or fee increases to passengers will pay for the new building but rather grants and bonds will cover the development. The airport also claims that it could save up to $23 million/year but then also states that they intend to lower fees for airlines – that’s confusing. I speculate that something else is the catalyst for the expenditures. Several years ago a large oil and gas deposit was found in the area around and underneath the airport. This led a bidding war with Consol Energy the winners of the contract for oil and gas rights. The airport was paid handsomely for this both in an upfront cash bonus of $50 million and 18% of the ongoing profit from the wells drilled as is customary in oil and gas agreements. The total payout is expected to achieve $500 million over the 20-year lease. Revenue from these wells and the bonus have made many initiatives possible at the airport without affecting the passenger experience. Other airports in oil and gas plays like Dallas/Fort Worth, Houston and Oklahoma City operate oil and gas pump jacks on property (hundreds of them at DFW). Drilling activity at PIT is mostly unseen and takes place horizontally underneath the 9,200 acres surrounding the airport but not actually at the airport proper. While new revenue from the bonus and contract was not directly linked to the funding for this expansion, it certainly improved the balance sheet. That allowed Cassotis and her team to take bold steps and made bonds more attractive to investors. It would be difficult to separate the series of empowered actions from the sizable income stream separate from passenger traffic increases that came at a critical time. While others may not see the necessity for a new terminal building, Cassotis and her team seem to not only have a mission, but also a plan for achieving it. That plan is in progress and it’s working. Passenger volumes are up, direct flights have increased from 37 destinations to 68 (and counting) and the terminal has attracted big airport shopping (Boss, Armani, Tumi and Disigual all operate in the terminal). The new facility will modernize the airport and set the stage for future growth serving both customers and carriers. What do you think about the new facility? Do you think Pittsburgh Airport leadership is on the right track? Previous Article Would You Switch to a Suite for One Night? In What Parallel Universe Is Heathrow Terminal 5 World’s Best Terminal? I’m hoping an observation deck can be added as part of the new landslide building!! This is the absolute dumbest idea the so-called city planners have EVER had!!! The math does NOT lie. Pittsburgh airport is one of the top 3 nicest airports in the country and was recently awarded the BEST airport IN THE WORLD for 2017!!!!! Take that $1.1 billion that you have suddenly found and fix the tunnels so business moves IN, not out.